The Longleaf subdivision in Atlanta has a problem. Constructed about 15 years ago, the 50 homes in the subdivision all have failing cedar roof shingles. However, thanks to a forward-thinking decision by the community’s HOA leadership, the green light has now been given to replace those deteriorating wood roofs with composite shake roofs. “The DaVinci Roofscapes team worked with me to approach the president of the HOA about a cedar alternative for his subdivision,” says Chris Braswell with Braswell Construction Group, Inc. “We showcased how composite shakes could look on the homes by installing the DaVinci product on a showpiece gazebo in the center of the community. 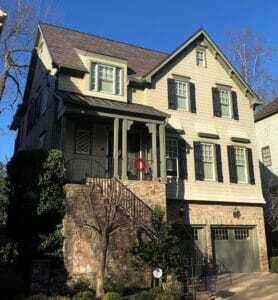 Bellaforté Shake roofing was selected for the gazebo and the first re-roofed house in the upscale Buckhead neighborhood in Atlanta. The attractive aspect of the natural, hand-sawn, jumbo cedar shake look, combined with the product’s durability and appealing pricing made Bellaforté a natural choice for the subdivision. After installing the central park area gazebo roof, Braswell and his team started with their first DaVinci Bellaforté Shake roof installation in the community. “This homeowner called after seeing the new gazebo roof,” says Braswell. 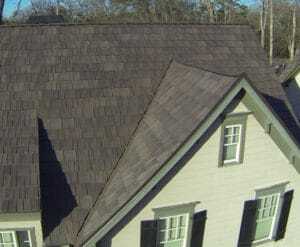 “He liked it as a better alternative to cedar shingles because of the easier upkeep. “The cedar shakes on his home were in terrible shape, like many of the other roofs in the community. This homeowner was having roof issues and was tired of stressing about the condition of the cedar. Along with the appealing new look, homeowners replacing their tired cedar shakes with Bellaforté Shake tiles are getting a stronger roofing product. DaVinci composite shake and slate roofs are all fire- and impact-resistant. Each DaVinci product has been independently tested to resist high impacts. Bellaforté tiles are also made to withstand strong winds and severe weather conditions. The composite tiles have been tested to resist straight line winds at 110 mph and have passed the TAS-125 certification test for wind uplift resistance in High Velocity Hurricane Zones. They’ve also passed the TAS-100 certification test for wind-driven rain. Plus, as an added bonus, each DaVinci roof is backed by a Lifetime Limited Warranty. “I’m a believer in the DaVinci composite roofing products,” says Braswell. “I installed my first DaVinci roof around 2009 and it still looks like the day we completed the project.